Needless to say I have been looking for some healthy snack options to tide me over when I am feeling famished. My trainer once told me that you shouldn't be starving yourself between each meal and that snacking is fabulous but to make sure it is a healthy nutritious snack. He claims that it will get your metabolism pumping and your body burning calories too! So I have been addicted to these quick easy berry bowls that are super simple to make and they are so gorgeous too. They are packed in wonderful things that are so good for you and I really think you could make a habit out of this! Minimilistic baker inspired me with this recipe, I just made some modifications. But she is seriously the queen of some incredibly gorgeous healthy food. Add berries and banana to a blender and blend on low until small bits remain . You want this thicker. Add a bit of coconut or almond milk and protein powder (optional), and blend on low again, scraping down sides as needed, until the mixture reaches a soft serve consistency. Scoop into 1-2 serving bowls and top with desired toppings (optional). 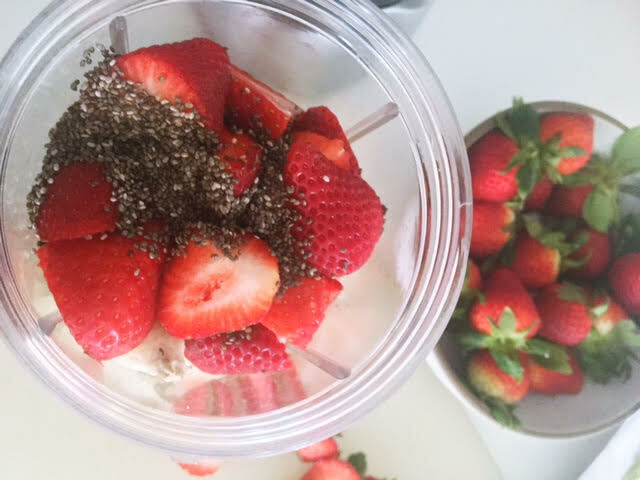 I prefer chia seeds, almonds, and coconut, but strawberries, granola and a nut or seed butter would be great here, too! Play with it. Add your faves. It's delicious and so so filling you guys!!! And love chocolate and peanut butter?! Check out one of my other smoothie bowls here.